My nomadic adventures during March and April have taken me around Scotland, to Somerset and Durham, Jerez in Spain, Abu Dhabi and Dubai and several transits through London. Wandering with no particular place to be has, at times, allowed for a luxury of quiet introspection. Walking aimlessly one day I couldn’t help but notice the City Council assertions around most corners that ‘People Make Glasgow’. And yes, I think Glaswegians, are somewhat special. Incomprehensible to most, but us self-deprecating, stoic Wegies are hospitable indeed. 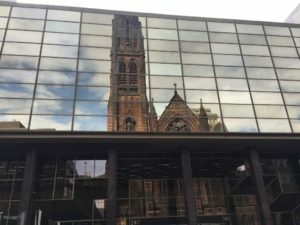 Glasgow’s identity I thought, however, was one that was more evident, literally, in the reflection of its buildings. The city’s story was evolving for me as one about honouring the past while embracing the new. I love that Glasgow has a third generation of locals of Asian origin who are just as unintelligible as their fairer contemporaries. 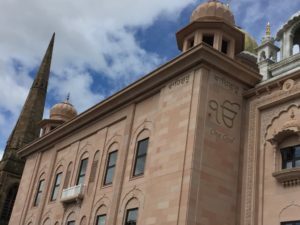 That cultures have embraced each other in their diversity is evident in the new Gurudwara that sits along side the old Tron Church, the ‘One God’ inscription clearly visible for miles around in its West End location. With cosmopolitan populations more commonly now the norm, my theme of buildings continues. Castles everywhere, thankfully no longer places of refuge to wage war against the enemy, but attractions for curious visitors to learn more of the history most of us ignored in school days passed. I was lucky to be shepherded by Julie around Jerez’s old city walls. I thought, however, the sherry houses of Jerez more aptly reflected the laid back nature of Europeans of these warmer climes. A place of fine, old and relaxed grandeur. Flamenco, tapas and sherry all a fine combination in the narrow, busy streets. The oil rich states of the Middle East are a different case again. Ultra modern, high-rise and hot. 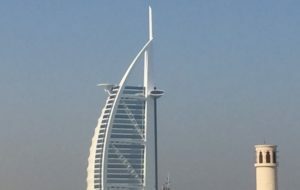 The Burj al Arab juxtaposed with minarets atop the Masjids prolific in the city’s skyline. But still the old life goes on in these sandy states. I admired the rhythmic stroll of desert dromedaries as, side by side, I spent a few hours with friends enjoying a gong-bath meditation in the arid desert planes. These two short months have, on the one hand, flown by, on the other, it seems like two years must have passed. So much learned and seen. My lack of planning, I would say, has not made me an ideal nomadic candidate, and I have missed a home base. But, of course, with the home base I would not be having all these experiences. Mainly I miss my very particular approaches to matters of food. What surprised me just last week, however, was that, in my travels, I am one of many. An empty-nester! A label now attached to a growing brood of fifty somethings now freed to wander. I look forward to meeting many on my way. I heard also of the pink pound (as in £) and there’ll be more on that later, as I make my way now from a Buddhist monastery in Eskdalemuir, en route to Hereford to serve as a volunteer in a Vipassana meditation centre before heading back to the Middle East. Another area that my Father travelled and plotted the mineral landscape of….The Middle East, and not Glasgow! Looking forward to hearing your tales of the ‘pink pound’! Your father was an interesting man it seems Rachel. Appreciate you reading my musings. Interesting times for me. As ever, supported by your wonderful nucleotides. Planning a blog soon on how I keep healthy and this will definitely feature.